And this is why you lose. Kansas City--a team that battered the Colts all game long with a two-headed running game--decided to go for it on fourth and inches with a quarterback sneak. This is why you lose. And this is why you lose, part II. Interception returned for touchdown. Interception thrown in the end zone. Fumble in the red zone. Missed field goal. Holding penalty. False start. This is why you lose. Not their best day. Perhaps the only reason the Colts won this game was because they were playing Kansas City (see above). Offensively, they were out of sync. Defensively, our run defense transformed into "run matadors" (term courtesy Nate Nocton via Tony Latello) who stepped aside so KC's backs could find daylight. 352 and 13. This is how many rushing yards Kansas City ground out...and how many points they managed to score. Perhaps I should've titled this section, "And this is why you lose, part III." Vontae Davis intercepted two passes. The final box score doesn't note this, but Vontae Davis intercepted two passes. Somebody wrote "pass interference" next to one of them by mistake. We're going streaking! At one point, Andrew Luck lit up the scoreboard by throwing eleven straight incompletions. He then proceeded to hit 6 of 8 passes on what turned out to be the game-winning drive. No hand? No problem! Even with his hand wrapped in a hard cast and soft foam shell, Jerrell "The Mountie" Freeman led the team in tackles. Actually, that would feel like more of an accomplishment if the Colts hadn't given up 352 rushing yards. Could you find one that fits? Brady Quinn's helmet didn't look like it fit. Actually, Quinn himself didn't look like he fit in the NFL either. That's too bad. His fantasy football logline from ESPN: "Quinn completed 10-of-22 passes for 162 yards and two interceptions Sunday against the Colts. He also added 11 rushing yards on five carries." ESPN's fantasy football analyst failed to add how important the potential 12th rushing yard could've been. 10.3 yards per carry. Jamaal "Give Me the Ball" Charles' average on Sunday. I once averaged 10.3 yards per carry during an entire season of Madden football. Reggie! Five catches, 81 yards, and a touchdown. That is all. The bullet. Take another look at Luck's game-winning touchdown pass. He absolutely rifled that ball! I'm just glad the momentum didn't carry Reggie Wayne out of the stadium. Seriously, #12 fired that thing. You're not getting it back. After the Chiefs failed at life by running with Peyton Hillis on third and long with less than three minutes left in the game, they punted. The Colts got the ball back, forced KC to drain their timeouts, and then faced a crucial third and ten. Vick Ballard took the ball around the left side for 13 yards. Game. Over. Drops. Drops. Drops. This was a less-than-stellar performance by Colts receivers. I remember a lot of dropped passes on a day when Luck needed some help. Rookie records crumble. Luck may get perceptually out-flashed by Robert Griffin III and out-underdogged by Russell Wilson in the rookie of the year race. They have fewer turnovers. They have more rushing yards. They have better completion percentages. 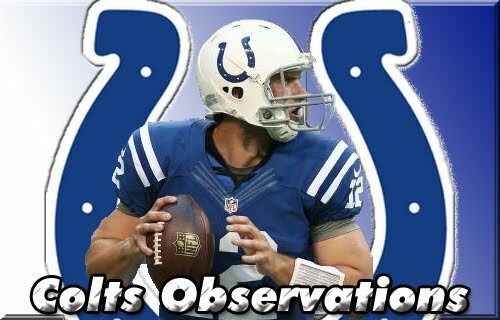 But Luck's team has demanded more of him, and he's set rookie marks for passing yards, completions, and attempts. So if he doesn't win ROY--an award I'm guessing he couldn't care less about--he'll have his records. And, again, I'm guessing he couldn't care less about those, either.